Today; actually, just about an hour ago, I realized that, in my attempt to be forthcoming, honest, and anxious about making a wrong move, I offended a young man with whom I wanted to assist me with the launch of my latest online product. Wow! How can you let it go when you are the one who inadvertently offended someone else? And when the project is one of the most important projects in your life’s work? Right now I feel crushed about it on a couple of levels. At one level, since I am new to the Internet marketing game and he is a self proclaimed millionaire in this game, I feel as though I may have truly short cut my opportunity to launch the product with him. I may also miss out on an opportunity to learn more about this game from a great resource. Second, I just feel bad because I offended someone I don’t know that well. Not my intent at all! And to make matters worse, his email response to me, more than likely as a result of being offended, was that he did not want to work with me on this launch. He did not even want to talk about it on the phone. That was crushing to my ego and spirit. Wow! My feelings are hurt. Seriously. Ok. The first step in letting go of acceptance and acknowledgment. With this situation, I am at step one. Lesson learned and I MUST re-gain my composure about this and move on. And I will. But in the heat of this moment, it is difficult. I will keep you posted on how I overcome this feeling of failure. I feel I failed myself and him. Oh boy!! You can read the next post I wrote that is related to this one – click HERE. 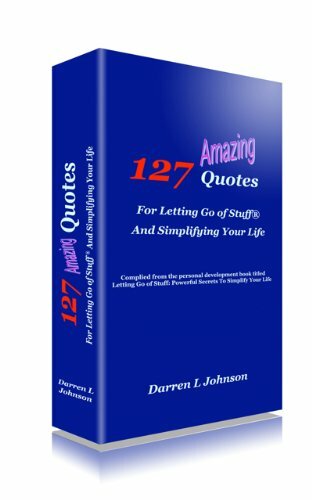 This entry was posted in Biz and tagged darren l johnson, fear, happiness, letting go of stuff, stress. Bookmark the permalink. Im not going to say what everyone else has already said, but I do desire to comment on your information of the topic. Youre really well-informed. I cant believe just how much of this I just wasnt conscious of. Thank you for bringing much more information to this topic for me. Im genuinely grateful and actually impressed. Thanks Hohler. Glad I was able to bring out the best in you through the blogging. I want to keep impressing others in such a way that they will comment, consider the concepts in their own life, and then share the blog with those who might benefit from it. Take care and thanks for subscribing. Why didnt I think about this? I hear specifically what youre saying and Im so pleased that I came across your blog. You actually know what youre talking about, and you produced me feel like I really should find out more about this. Thanks for this; Im officially a enormous fan of your weblog.